British wildflowers and British roadsides | Notes from the U.K. I don’t want to romanticize the British countryside—enough people will do that without my help—but British wildflowers are enough to tempt me. They grow along the roads, in the hedges, in the stone walls, in the fields if they can, in the garden if you’ll let them, anyplace a teaspoonful of soil gives them a place to sink their roots. When I first moved here from Minnesota, never mind their beauty, I was overwhelmed by the sheer number of them. Trying to keep track of things you have no name for, it turns out, is next to impossible, and I’ve gradually learned to name the most common ones. I’ve written about that elsewhere, so I won’t repeat the tale here except to say that I settle for the broadest categories. I can’t tell the one speedwell from the next and forget about all those yellow things that look like dandelions but aren’t (hawkweed, hawkbit, cat’s-ear…). Thrift growing by the coast. The church in the background is St. Materiana. In late June, the “Plantwatch” column in the Guardian wrote about the roadside verges— if you’re not British, those are the stretches of land that run beside the roads—as wildflower refuges. It was one of those things I’d known but hadn’t known, since the thought didn’t come in any form I could use. I hadn’t put words to it. I’d seen the flowers growing there, I’d been struck by their richness, but thinking of the verges as refuges changed the way I see them. So every day I walk the dog past wildflower refuges. 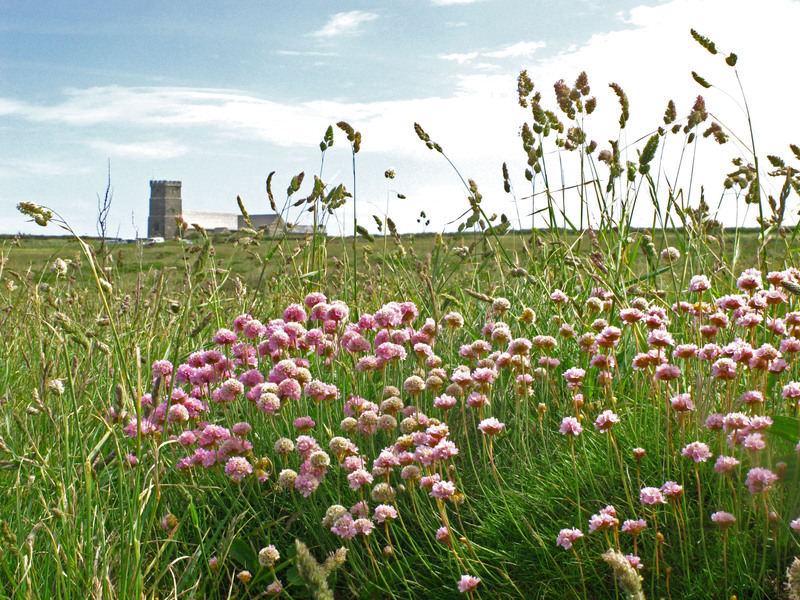 It turns out that almost half the native plants in Britain—700 species—grow on the verges. It’s perfect habitat: unplowed, unfertilized, unweed-killered, and for long stretches of time, unmowed. Basically, the plants are left along to do what they know how to do. Before modern medicine, the verges and hedges, as well as being beautiful, were as drugstores. Hedge woundwort is a mild antiseptic. St. John’s wort—now sold as an herbal antidepressant—was used for treating wounds, and modern research shows that it is, in fact, an antibacterial. Valerian was used as a mild sedative, and you can still buy it in health food stores. Scurvywort is full of vitamin C and was used to treat (predictably) scurvy. It’s become more widespread since they started salting roads after a snow, which creates perfect conditions for it. Dyer’s greenweed was used to treat gout. I don’t know how well it worked. Some of the herbal medicines worked reasonably well. Others—let’s just say they gave patients something to think about while they were sick. Maybe it took their minds off their problems for a while. I have no idea who measures these things, but if you put the verges all together they’d cover the Isle of Wight. How big is the Isle of Wight? Interesting you should ask, since I just happened to google it: 380 square kilometers. What’s that in miles? You don’t want someone like me pretending to answer a question like that. But forget the numbers. The roadside verges are a treasure chest—one that’s easy to overlook because they’re just, you know, sitting there beside the roads, with no signs, no warnings, and no admission fees. This entry was posted in Other Stuff, Traditions, Walking by Ellen Hawley. Bookmark the permalink. They are beautiful and too often we take them for granted. I love that the varieties of wildflowers vary from region to region. When I drive back to my home town to see my mother this weekend, I shall marvel at the array of buttercups by the roadside, which for some reason refuse to show their faces where I live. Simple pleasures! Indeed. I didn’t know that about buttercups. They’re everywhere here, so I mindlessly assumed they were everywhere everywhere. But I have noticed that even with a change of a few miles the flowers can change. A stretch of the cliffs near Tintagel is full of kidney vetch, ranging from yellow to almost full-on red, which I haven’t found anywhere else. A yard full of them wasn’t our plan, but they do seem to be moving in. This hasn’t been much of a gardening year for us and–well, you know, once they cross the property line they’re officially weeds, and they’re taking over. Such beauty in some weeds. I’d take them !! And the verges are refuges for wildlife too. All manner of cute little furry mice, voles and shrews, along with insects and some nesting birds. Our local council has a policy only to mow the verges after nesting time is over – mind you that could be budget cuts masquerading as environmental awareness. But it looks prettier for longer so I don’t mind. We have the tiny wild strawberries out at the moment. If you know where they are hiding, there’s nothing better than a tiny taste of summer as you walk along. I’ve never found wild strawberries in the U.K. Wild Thing and I found a field full of them in northern Minnesota years ago and we more or less ate our way across the field, crawling on our hands and knees. I’ve never tasted any strawberries like them. These grow on sunny banks that build up at the base of hedges. I have alpine strawberries in my garden which are slightly larger than the wild ones, but taste the same. That one handful of tiny strawberries is worth more than a punnet of shop bought ones. I believe you. Although the commercial strawberries here are much better than the ones in the U.S. I always used to like British country roads, except for the fact that even on very narrow roads the locals used to drive like no one else would ever use them. As to the wildflowers: I’m ever so happy we have them here in the Texas Hill Country. Yeah, the roads do take some getting used to. They terrified me at first. And at this time of year, when the grasses haven’t been mowed yet, the roads seem even narrower than usual. As to the other drivers, all I can say is that most of them survive. You do love the Texas Hill Country, don’t you? As to your question: yes, I do love the Texas Hill Country and I’m ever so happy we had the opportunity to move here. Point taken. I was thinking that if one driver survived the other would too, but that’s not really a given, is it? I miss the real countryside living in the London suburbs but our local council has been planting wildflowers all over the place and they are brilliant. Prince Charles has had a wildflower meadow planted outside Clarence House; it looks so naturally beautiful compared with the manicured flowerbeds near the Palace. Funny that they’d have to plant wildflowers, but yes, it makes sense. Friends did the same on a field, first starting with a parasitic plant that weakened the grass so the wildflowers would be able to compete. Now, a few years later, it’s beautiful. How lovely. Only wish we did more of that in the States. I don’t know for a fact that US roadsides get pesticided, but I’m guessing a lot of them do, so that would need to be stopped, which would be better all around. They definitely do around here. Folks put up “do not spray” signs which are often ignored. Problem out here in the Pacific NW is that things grow like crazy and poison oak and blackberries take over unless they’re kept under control. I suspect that wildflowers wouldn’t stand a chance. The blackberries here are vicious. If you don’t dig ’em out, they’ll reach in through the window and strangle you in your sleep. But the gardeners I know about them seem to rely on digging them out (in ours that may involve dynamite, but I’ll leave that tale for another time), and in the hedges they just grow. Left to themselves, they seem to coexist with other shrubs and wildflowers. I’m guessing the farmers rely on weedkillers, since they’re dealing with them on an industrial scale. I’ve been trying to think of spots where they’ve been left to themselves around here. Mostly what comes to mind are the impenetrable thickets of the vicious things that will certainly ensnare and strangle. But then I’ve seen roadsides where they seem to stop before reaching the pavement and there is a chance for some wildflowers to appear. I suspect the difference might be the indigenous ones, which are slightly more civilized and then there’s the introduced Himalayan sort which are far tastier, but aggressive and nasty to an extreme. We have morning glory coming up through the asphalt driveway. That’s not just through existing cracks. This stuff literally erupts out of the asphalt like a miniature volcano. Impossible to eradicate. Don’t know if it’s introduced or a native, but it least it hasn’t been known to take over dwellings. Unsellable sounds good enough to me! I planted some in a pot once, thinking that would contain them. They reached through the drainage hole, through gaps between the patio bricks, and came up in the rose bed. On the top end, they reached through the air, caught two plastic chairs and were busy strangulating them. They are beautiful, though. Here they have bindweed–same thing, but white. I’m not sure it’s quite as, um, enthusiastic. Now you make me envious for wildflowers just when I’ve bought this place with heaps of landscaped beauty that I’ve been desperately trying to get the hang of. Might have to rethink all this and just let the wild ones back in! We-e-ell, I’ll admit to yanking weeds out of our garden whenever we get around to it, which isn’t as often as it should be. I love the wildflowers, but I love a bit of planted, planned beauty as well. I love seeing all the wild flowers growing on the verges or in the middle of roundabouts. Many cemeteries have also become a bit wild in order to be flower, insect and bird sanctuaries which I also enjoy since I love both flowers and graveyards. Your comment makes me think about how different graveyards are in Britain than in the U.S. Because so many of them double as churchyards here, they’re not separated out from life itself. People were expected to pass through them, and even though not many people go to church anymore it’s left them with a very different atmosphere. I think that’s part of it, yes. I think the decision to turn over some of the vast municipal cemeteries in London to nature was a conscious one because of the lack of other green spaces for flora and fauna. Cuts down on the maintenance bill also, if one looks at it cynically. A few years ago I spent a few hours in a vast cemetery in London looking for my great-gran dad’s grave. When I found it in an overgrown thorny thicket, I was cursing the “back to nature” policy but generally I’m supportive of it. Yeah, thorns are taking it a little too far, but damn, those blackberries are voracious. I crawled between our back fence and the bushes last spring trying to pull them all out of our little patch, and already they’re back. I’ve seen a number of churchyards here with signs about the long grass being a deliberate decision, to help wildlife. I assume they’re trying to minimize the complaints. To me, it looks nice–soft and natural. Whatever “natural” means. Sounds positively breathtaking from my perspective! I think my heart yearns for UK countryside in summer. So temperate, so floral. Seriously. Dreamy! How wonderful. Iowa is getting better at not spraying ditches, but there’s some criteria for that… protected plant life? designated prettiness? not sure. Reminding them that it saves money? When the high-minded reasons don’t carry any weight, that one does. Our metropolitan suburban garden is situated not far from some (relatively rare) mixed oak/hornbeam woodland, and with that woodland comes the pretty yellow spring flower, the Celandine. Over the years the Celandine has spread further and further into our flower beds. Though, in a garden context may, would consider it to be a voracious weed, in reality I find it a delight and no trouble at all. It comes up and flowers just after Easter, forming a brilliant yellow carpet over the otherwise empty flower beds, and then, before the perennial cultivated flowers I’ve planted there start to grow in earnest, the Celandine foliage withers and disappears for another year. Simply marvelous – and I don’t have to do a thing to cultivate it! Now that’s a well-behaved visitor. This land would be fine even if all humans vanished, as the wild flowers reclaim every last inch they can get their roots into. For me, though, the best time was the 1950s when I was a child – then the verges and fields were full of much more than now, and there was more hedgerow: much of it has been destroyed. I wish we had both wild garlic and Cornish leeks here, but the leeks smell surprisingly like garlic to me. I love them–and they make me hungry. I wish I’d seen the verges and hedgerows as you describe them. They’re beautiful now. They must’ve been stunning then.